Because the costs of higher education must often be offset by some form of financial assistance, we encourage you to apply for financial aid. Completing and submitting the Free Application for Federal Student Aid (FAFSA) at www.fafsa.gov gives you access to the largest source of financial aid – grants, loans, and student employment. The application processing cycle lasts 21 months. For the 2018-19 award year, applications are accepted beginning October 1, 2017 through June 30, 2019. For the 2019-20 award year, applications are accepted beginning October 1, 2018 through June 30, 2020. Many students erroneously think they will not qualify for Federal Student Aid and don’t complete a FAFSA. If you are one of those students, check out this list of myths and the truth behind the many misconceptions about the application process. We know aid can be confusing so we’ve tried to make it easier by outlining the steps you will take while including videos and infographics to help you understand the process. First, check out this video for an overview of the FAFSA process. FSA ID (a parent will also need a FSA ID if the student is dependent). Instructions on how to create an FSA ID are below. 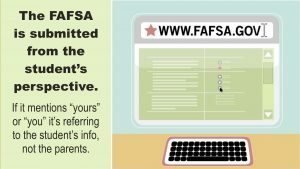 Not sure whether you’ll need to provide parental information on the FAFSA? Watch this video to help you determine whether you are a dependent or independent student. Confused about which parents’ information you should use on the FAFSA? Use this info graphic to help make that determination. The FSA ID is a username and password used to log in to certain U.S. Department to Education web sites. Your FSA ID confirms your identity when you access financial aid information and electronically sign Federal Student Aid documents, such as a Master Promissory Note for Federal Direct Loans. The FSA ID is replacing the PIN for anyone who has an existing PIN. You must create an FSA ID when you first log in to the following sites: www.fafsa.gov, www.nslds.ed.gov, www.StudentLoans.gov, www.StudentAid.gov, and www.teach-ats.ed.gov. You only need to create an FSA ID once. When logging in to one of the above FSA sites, click the link to create an FSA ID. Create a unique username and password, and enter your e-mail address. Provide your name, date of birth, and Social Security Number. Provide answers to 5 challenge questions. If you have a PIN, you will be able to enter it and link it to your FSA ID. You can still create an FSA ID if you have forgotten or do not have a PIN. Confirm your e-mail address using a secure code, which will be sent to the e-mail address you entered when creating your FSA ID. Only the owner of the FSA ID should create and use the account. NEVER share your FSA ID or password. The FSA ID contains personal identification information you should never share. Check out www.StudentAid.gov for more information about the FSA ID or click here. For additional tips when creating and using your FSA ID, click here. To apply for financial aid, you (student) must file the FAFSA at www.fafsa.gov. Only the student should complete the FAFSA with the assistance of a parent, if parental information is required. Filing the FAFSA gives you access to federal grants, loans and work-study. When you file the FAFSA, you will also be considered for state and institutional financial aid. State aid programs may require completion of additional forms or application. WV residents, refer to the WV State Level Application tab for instructions on applying for WV state aid. Some scholarship applications may require you include your Expected Family Contribution (EFC), which will show on your FAFSA Confirmation Page. 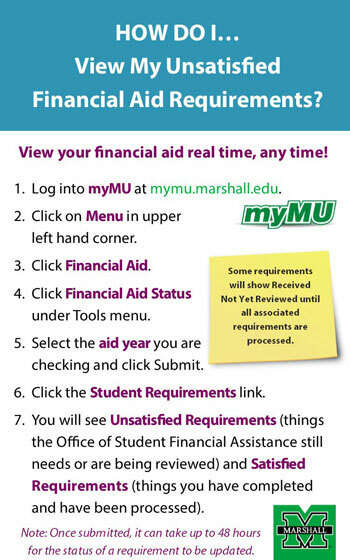 You must include Federal School Code 003815 if you want Marshall University to receive your FAFSA. 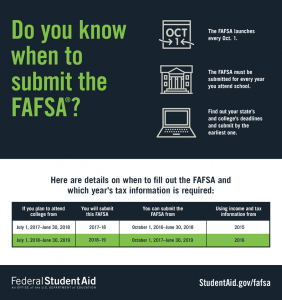 For assistance completing the FAFSA, you may call the Federal Student Aid Information Center at 1-800-4-FED-AID (1-800-433-3243 ) or look for the Help Tip box on the right side of the page while completing FAFSA on the Web. 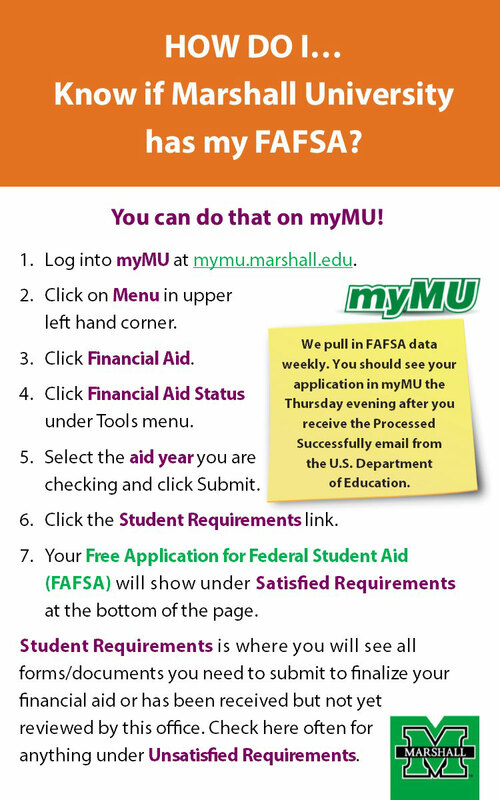 Marshall’s priority filing date for the FAFSA is March 1. You may file the FAFSA after this date. The FAFSA becomes available at fafsa.gov October 1 and closes June 30 two years later. Example: The 2019-20 FAFSA opens October 1, 2018, and closes June 30, 2020. The FAFSA requires income information for the specified tax year. 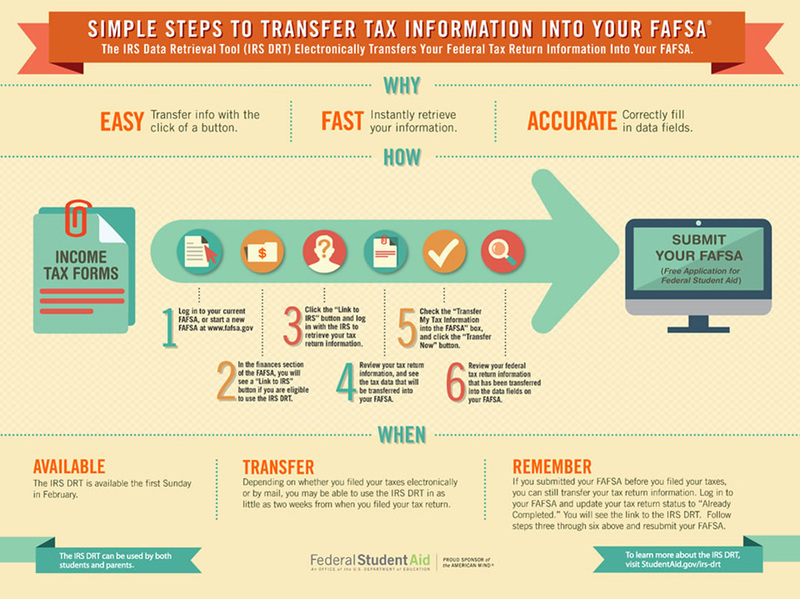 Be mindful that other household information may not be based on the tax year but dates specified on the FAFSA. Remember, if you wait until the last minute to apply, some financial aid programs may not be available to you because they are first-come, first-serve. 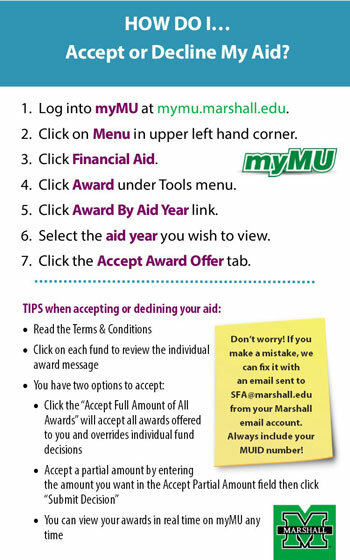 Also, your financial aid awards may not be finalized by the billing due date. We urge students (and parents) to use the IRS Data Retrieval tool when completing or making corrections to the FAFSA. The IRS does have to process the tax return before IRS Data is available for transfer. Because the FAFSA uses earlier tax information than in previous years, parents and students should have already filed the needed Federal tax information with the IRS. This means you (and parents) should be able to use the IRS Data Retrieval Tool when initially completing the FAFSA. My FAFSA is submitted, now what? What happens after the FAFSA has been completed? Watch this video to find out. WV residents should visit www.cfwv.com to apply for West Virginia’s merit-based PROMISE Scholarship and other scholarship programs administered by the WV Higher Education Policy Commission. Students applying for the WV PROMISE Scholarship and the WV Higher Education Grant Program must also file the Free Application for Federal Student Aid (FAFSA) at www.fafsa.gov. Students must also complete a state-level financial aid application at www.cfwv.com by March 1. In addition, high school graduating seniors must take the ACT or SAT by the scheduled dates in June and ear the necessary scores. The criteria for this scholarship are listed at www.cfwv.com. For help completing the WV PROMISE Scholarship application or questions about it or the WV Higher Education Grant, you should call the West Virginia Higher Education Policy Office of Financial Aid and Outreach Programs at 1-888-825-5707 or 1-304-558-4614 . Searching and applying for scholarships is another way to help pay for college. Scholarships can be found from a variety of sources such as local businesses, organizations, churches, etc. but do require some research. These require no application. All first-time freshmen admitted to the university are considered for these scholarships based on test scores and gpa. Explore our Merit-Based Scholarships to find out what you may qualify for. Many donors have given to Marshall University for privately funded scholarships, which have been made available for Colleges and Departments, to select students. Scholarships do require research. Remember to think outside the box. Not all scholarships are academic based. Are you left-handed? Search for scholarships based on being left-handed. Are you a first-generation student? Do you participate in bowling leagues? Do you like asparagus or any other vegetable? There may be scholarships based on things you are interested in or participate in or are unique to you. You do have to seek out these scholarships so go search! As a courtesy to students, we’ve posted a list of Outside Scholarship Organizations, who have contacted this office to assist with soliciting applications. Marshall University has no affiliation with these organizations with regard to the development of the scholarship program or selection of the recipients. You should never be required to pay a search fee for scholarships. Any site asking for payment is probably a scam. Learn how to protect yourself at www.studentaid.gov/types/scams. Summer Schedule of Courses is available at www.marshall.edu/milo/milocou.asp; advanced registration (currently enrolled students) begins Monday, April 1; and, open registration (all admitted and re-admitted students) begins Monday, April 29. The Office of Student Financial Assistance will process Summer Financial Aid Requests on a first-come–first-serve basis. The review of Summer Aid Requests will commence on Tuesday, April 2. Due to the high volume of summer aid requests and the complexity of determining student aid eligibility for summer enrollment, processing time typically takes a minimum of 10 business days.